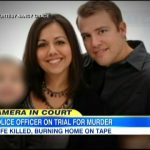 Today, Dan appeared on Good Morning America to discuss the former police officer, Brett Seacat, who shot and murdered his wife. In this clip, alongside Nancy Grace, Dan discusses how forensics are going to strengthen the prosecution’s case, in order to show that it was a murder, not a suicide. Says Dan, “You add to that that the fact that you have motive, you have incriminating statements from him, you have incriminating statements that she made before she died about him, and you’ve got this note that was found where it seems that he’s taking notes about what he should say when he’s arrested. So, this is a very strong case.” When asked what might contradict the evidence against Seacat, Dan continues, “The only hope is the alleged suicide note. Right, prosecution expert has come in and said she didn’t write it. If these jurors believe she didn’t write it, he’s done. Case is over. I don’t care if he takes stand or doesn’t take stand, he’s got no chance. If the jurors have some doubt, there are some questions, maybe she could have written it, that’s his only hope in this case.” For more, watch the segment here.